Ohio experienced an estimated net loss of 750,000 good-paying manufacturing jobs between 1969 and 2009. Why did that happen, and what were the consequences for middle-class households and communities across the state? 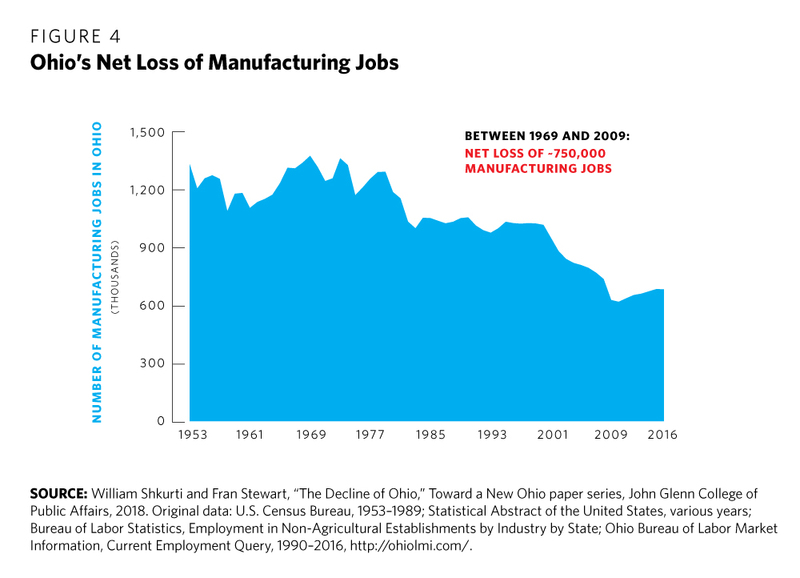 Ohio experienced an estimated net loss of 750,000 good-paying manufacturing jobs between 1969 and 2009.1 Why did that happen, and what were the consequences for middle-class households and communities across the state? Policymakers seeking to build broad-based support for their trade agenda must grapple with this question. According to OSU’s research, foreign trade accounted for no more than one-third of these manufacturing job losses in Ohio; a far greater number resulted from other factors, notably automation and domestic competition with other states.2 It is vital to understand how these nontrade-related factors impacted Ohio’s manufacturing employment over the last several decades, in order to appreciate why the economic well-being of blue-collar workers in Ohio cannot be advanced though adjustments to trade policy alone. That said, it would be a serious mistake to minimize the impact of the trade-related manufacturing job losses. Everyone who lost a job due to outsourcing, offshoring, or import competition had family, neighbors, and local shops dependent on their businesses. Entire communities were devastated. Several hundred thousand Ohioans were directly or indirectly affected. And for many of them, this was not just about the loss of employment, but also the gradual unraveling of a de facto social contract that once existed between government, business, labor, and communities. This chapter provides an account of how Ohio’s middle-class fortunes became intertwined with manufacturing jobs in the 1950s–1960s. It reviews how so many of those jobs were subsequently lost in successive decades, due to both trade- and nontrade-related factors. And it examines the record of TAA programs aimed at easing the pain. For these various reasons, Ohio enjoyed a per capita income exceeding the national average through the 1950s and 1960s. 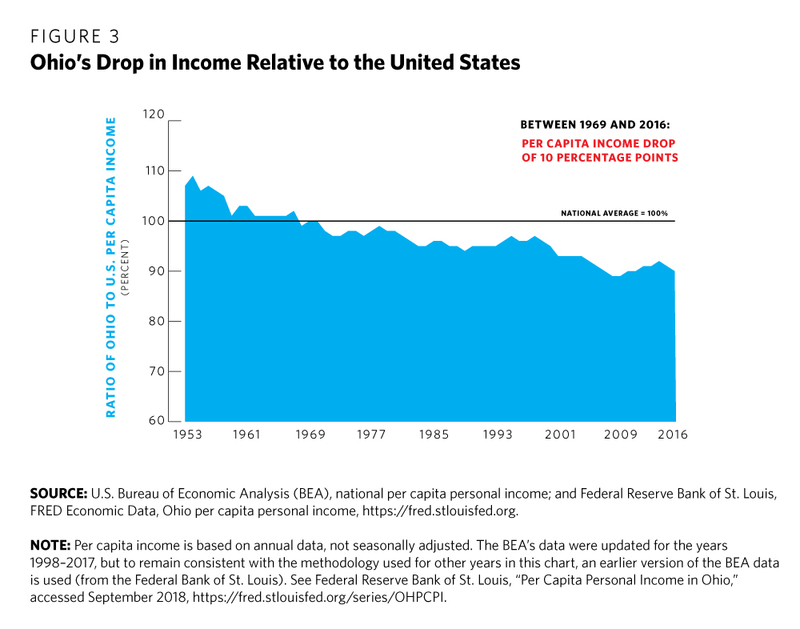 However, Ohio’s per capita income dropped below the national average in 1969 and declined steadily for the next half-century. That drop coincided with the estimated net loss of 750,000 manufacturing jobs from their peak of almost 1.4 million in 1969 (see figures 3 and 4). U.S. manufacturing employment nationwide suffered as the United States experienced recessions (in 1970 and from 1973 to 1975) and as unemployment and inflation—stagflation—rose astronomically. The economic challenges of the 1970s and early 1980s stemmed from various domestic factors, which policymakers responded to with major shifts in monetary and fiscal policy. However, geopolitical shocks, foreign economic competition, and foreign policy also played significant roles. The economic challenges of the 1970s and early 1980s stemmed from various domestic factors, which policymakers responded to with major shifts in monetary and fiscal policy. However, geopolitical shocks, foreign economic competition, and foreign policy also played significant roles. Unlike much of the rest of the nation’s manufacturing sector, where employment ultimately rebounded in the mid-1970s and peaked in 1979, Ohio’s manufacturing sector did not. The dominance of the auto, steel, and rubber industries in Ohio accounted for much of this variance. These industries enjoyed antitrust protection, but it came with a downside: diminished imperative to innovate.11 Even as the economy recovered, they still faced severe challenges from increased foreign and domestic competition and evolving demand for steel, and they were more sensitive to energy prices and currency fluctuations. In terms of increased foreign competition, U.S. efforts to support the economic reconstruction of Europe and Japan after the Second World War created new markets for U.S. products and helped resist Soviet expansion. However, this support also produced stronger competitors for U.S. manufacturers. Between 1950 and 1970, the European Community (EC) tripled its steel production.12 In 1959, U.S. steel consumers began importing foreign steel when domestic producers could not meet the demand during a 116-day shutdown led by North America’s largest industrial union, United Steelworkers.13 In the 1960s and early 1970s, Japan emerged as a major player in the international steel market, achieving its peak production by 1973.14 Throughout the remainder of the 1970s and early 1980s, Japanese industries benefited from their government’s support, and as a result, Japan widened its edge in productivity over both the EC and the United States in terms of output per worker. As this crisis was unfolding in Youngstown, the nation at large was contending with mounting inflation, which had reached 11 percent by 1979.18 In response, the Federal Reserve Bank tightened the money supply, allowing the federal funds rate to approach 20 percent. The recession of 1981–1982 followed, pushing unemployment to 11 percent. It was the worst economic downturn experienced between the end of the Second World War and the Great Recession of 2007–2009. Manufacturing and construction businesses in Ohio were hit especially hard. Against this backdrop, at a 1984 campaign stop at the Ling-Temco-Vought (LTV) Steel plant in Cleveland, Ohio, then presidential candidate Walter Mondale criticized incumbent president Ronald Reagan’s decision to lift quotas on Japanese steel imports and claimed that “Reagan’s policies are turning our industrial Midwest into a ‘rust bowl.’”19 The media adjusted Mondale’s term to Rust Belt, which played off better against Sun Belt, a term coined to describe the U.S. Southeast and Southwest. The U.S. auto industry also eventually managed to claw back some of the market share it had lost in the 1970s and early 1980s. The revamped auto industry did not, however, revert to providing the type of employment it had offered prior to the 1970s, when it faced little competition from German and Japanese imports. As the industry bounced back in the 1980s, auto plants became more efficient, employing fewer workers, but foreign automakers began locating production in the United States. Thus, the local labor market effects played out unevenly in Ohio.21 Communities such as Marysville and East Liberty benefited greatly when Honda established facilities there and created 14,000 jobs. But Lordstown saw employment at its General Motors plant drop from a peak of 12,000 employees in 1985 to fewer than 2,000 today. Cleveland, Dayton, and Mansfield lost entire auto plants. The approximately 400,000 manufacturing jobs lost [in the early 2000s] were the most during any decade since manufacturing employment peaked in 1969. This was due to three dominant factors: China’s accession to the WTO, automation, and the Great Recession. Leaving aside the ongoing debate, three points regarding NAFTA’s effect on Ohio jobs deserve highlighting. First, manufacturing levels in Ohio remained constant through much of the 1990s (see Figure 4). Any significant number of Ohio manufacturing jobs lost due to the agreement appeared to have occurred from 1999 onward.26 Second, negative perceptions of NAFTA at least partially stem from concrete cases of key Ohio employers relocating production facilities to Mexico. For example, LG Displays, Goodyear Tire and Rubber Company, Delphi Corporation, and Honeywell International all moved production plants from Ohio to Mexico in the early 2000s.27 According to Department of Labor data on TAA petitions, the most significant layoffs in the 1990s and early 2000s occurred among auto, steel, and electronics manufacturers, including General Motors, Severstal Warren, and Huffy Bicycle, each idling over 1,000 Ohio workers.28 Finally, the total number of NAFTA-related job losses, while highly visible, were relatively small in comparison to those lost due to competition from China and other factors in the years 2000 to 2010. More than 1 million Ohioans worked in the manufacturing sector at the beginning of 2000. That number dropped to just over 620,000 in 2010; the approximately 400,000 manufacturing jobs lost were the most during any decade since manufacturing employment peaked in 1969.29 This was due to three dominant factors: China’s accession to the WTO, automation, and the Great Recession. After granting China the status, U.S. firms decided it was worth the sunk costs and risks to shift some production to China, where there were lower long-term labor costs.31 Simultaneously, Chinese producers decided they could afford to rapidly expand into U.S. markets. And upon recognizing that China was entering a phase of comparative advantage with reduced labor costs, U.S. firms then accelerated domestic investments in automation and other technological enhancements to better compete. This trifecta precipitated a major net reduction in U.S. manufacturing jobs, disproportionately borne by manufacturing states like Ohio. The losses considerably offset the export-related jobs created in the United States as a result of increased market access in China. The major industries concentrated in Ohio are among those most exposed to automation and related job losses. For manufacturing industries like those in Ohio, robotics is one of the main technologies that has displaced good-paying jobs.40 According to the Robotic Industries Association, the automotive industry is the primary driver of growth in robotics, with plastics and rubber, semiconductors, electronics, and metals also showing significant growth.41 Thus, the major industries concentrated in Ohio are among those most exposed to automation and related job losses. Notwithstanding the ongoing robots versus trade debate, few economists dispute the devastating impact of the Great Recession on Ohio’s manufacturing industry. Even before it hit in December 2007, Ohio manufacturing job numbers had dropped from more than 1 million at the start of the decade to 772,000 (see Figure 4). Manufacturing employment levels plunged further to 621,000 by the end of the Great Recession in 2010. Recessions often hit the manufacturing sector harder than others, as evidenced by the loss of nearly 150,000 Ohio manufacturing jobs over just three years. But manufacturers have historically taken advantage of slowdowns to restructure and innovate, helping the sector to rebound, at least partially, in the post-recession period to a new equilibrium. The manufacturing job losses from the Great Recession, however, were especially deep and the recovery much shallower (see Figure 5). 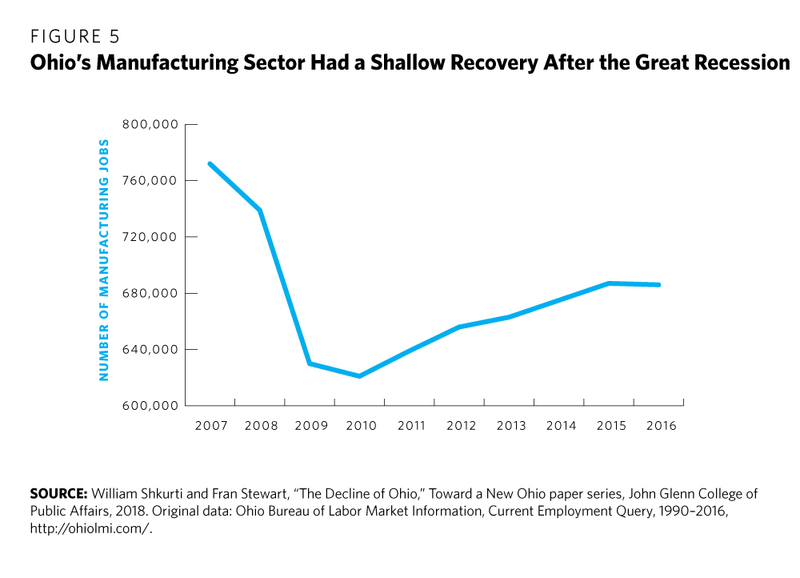 Almost a decade later, Ohio’s manufacturing employment remains well below levels seen before the Great Recession due to the aforementioned combination of factors: industry restructuring, innovation, automation, offshoring, and import competition (including due to mercantilist practices).42 These factors permanently changed Ohio’s manufacturing sector, and no strategy will bring back all the lost manufacturing jobs—not even to the levels of the 1990s. In the 1960s, president John F. Kennedy was the first to introduce a TAA program as a way to shore up domestic political support for free trade on both sides of the aisle. He was determined to head off Soviet and Chinese attempts to undermine U.S. alliances in Europe and Asia and believed that increasing U.S. imports of allies’ goods would strengthen ties with them.47 Succeeding presidents from Nixon and Reagan to George W. Bush and Obama would come to view trade in similar terms—as one important component of binding like-minded allies together in the face of escalating geopolitical competition with adversaries and rising powers. Successive administrations promoted trade liberalization over the next half-century, but trade adjustment assistance never kept pace and meaningful adjustment strategies for communities that lost their economic base never materialized. McDonald’s vision was never realized. What emerged was only a shadow of what he had in mind, as opposition to the program persisted across the political spectrum. In the 1960s, the levels of assistance turned out to be far less than envisaged, thereby creating buyer’s remorse for original trade skeptics who regretted having sold their support for free trade on the cheap. Nixon proposed a much more ambitious undertaking in the early 1970s, as part of his larger efforts to expand and overhaul unemployment insurance, but the proposal was largely rebuffed by business and labor alike, albeit for different reasons. Even the more modest version that Congress adopted, and which ended up helping more displaced workers, cost $4 billion in the 1970s.48 The high price tag provoked criticism of fiscal unsustainability and triggered substantial cuts during the Reagan era. Meanwhile, criticisms persisted regarding the inherent unfairness of the program. It provided support to foreign trade–displaced workers but not those displaced by domestic competition, automation, or changes in consumer preferences. And even with respect to the trade-displaced workers, the program was chastised for sustaining the unemployed rather than retraining them or helping businesses adjust to new economic realities, as originally promised. Successive administrations promoted trade liberalization over the next half-century, but trade adjustment assistance never kept pace and meaningful adjustment strategies for communities that lost their economic base never materialized. Between 2000 and 2016, an estimated 133,000 workers in Ohio were certified as eligible to receive TAA benefits. Seventy-five percent of these workers were certified on the basis of increased imports or shifts in production to a foreign country.51 Even if eligible, not all participated.52 And for those who did receive TAA benefits, comprehensive data are hard to come by on what percent secured reemployment at an equal or higher wage after having lost a good-paying manufacturing job due to trade. The real challenge going forward is not to return the manufacturing sector to its previous levels of employment—that is no longer possible—but to restore a new social compact within Ohio’s new, more diversified economy. Those interviewed also noted that the experiences of trade-displaced workers have varied considerably across the decades and in different firms—even within the same industries—due to the arrangements negotiated between labor and management. They viewed the lead time provided for layoffs, the company-provided support for reemployment, and the generosity of severance packages as considerably more important than TAA, especially for longtime employees.54 Labor representatives stressed that trade- and automation-related job displacements have been occurring since the 1950s. However, the trauma created by these dislocations has been more acute in recent decades, because workers in many companies have had less say over the transition arrangements. 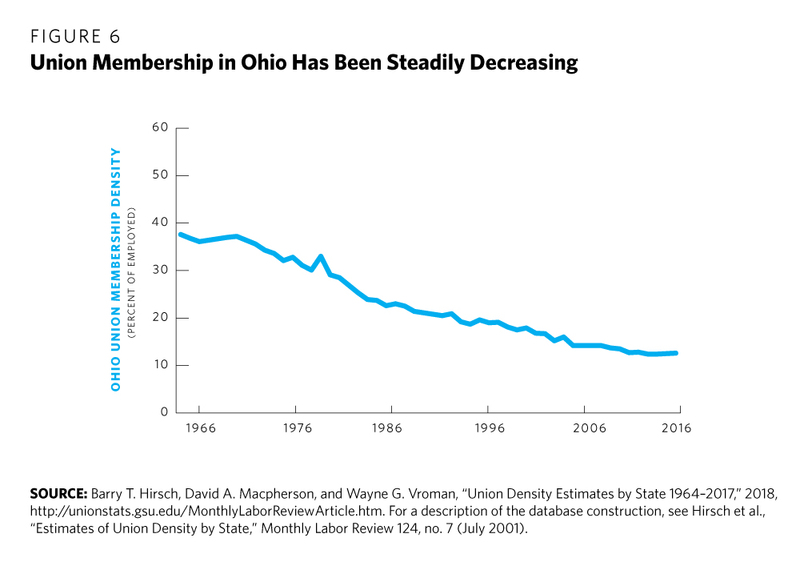 Labor representatives cited this as one relevant effect of the decline in private sector union density over the past fifty years.55 In the case of Ohio, the percentage of all nonagricultural unionized workers dropped from 37.2 percent in 1970 to 12.6 percent in 2017 (see Figure 6). The above story is not just about the decline of employment in Ohio’s manufacturing sector and the failure to provide adequate adjustment assistance. It is about the impact on communities that lost their resource base and their identities. They did not have the ability to quickly reload their employment base, and they frequently lost the ability to invest in their future. The story is also about the unraveling of a social compact among business, labor, and government that once worked for the middle class—by spreading prosperity more equitably across the state, bringing dignity and status to families and communities, and building a solid nexus between skills training and jobs. The real challenge going forward is not to return the manufacturing sector to its previous levels of employment—that is no longer possible—but to restore a new social compact within Ohio’s new, more diversified economy. 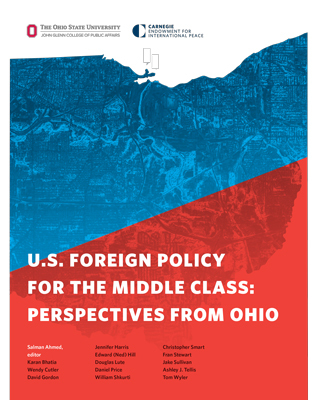 1 William Shkurti and Fran Stewart, “The Decline of Ohio,” Toward a New Ohio paper series, John Glenn College of Public Affairs, 2018, http://glenn.osu.edu/toward-a-new-ohio/. 4 1960 Census of Population, “Advanced Reports: General Population Characteristics,” March 28, 1961. 6 Lee E. Ohanian, “Competition and Decline of the Rust Belt,” Economic Policy Paper 14-6, Federal Reserve Bank of Minneapolis, December 2014, https://www.minneapolisfed.org/~/media/files/pubs/eppapers/14-6/epp_14-6_rev.pdf. 9 For a brief but more detailed account of changes to U.S. international economic policy during this period, see “Nixon and the End of the Bretton Woods System, 1971–1973,” Office of the Historian, Department of State, https://history.state.gov/milestones/1969-1976/nixon-shock. For a much fuller discussion, see Peter Peterson, “The United States in a Changing World Economy, Volume 1: A Foreign Economic Perspective,” December 27, 1971, https://catalog.hathitrust.org/Record/006243860. 10 In his remarks on “Oil and the Economy” delivered on October 21, 2004, then Federal Reserve Bank governor Ben Bernanke explained that “. . . during the 1970s and early 1980s, both the first-round and second-round effects of oil-price increases on inflation tended to be large, as firms freely passed rising energy costs on to consumers, and workers reacted to the surging cost of living by ratcheting up their wage demands. This situation made monetary policy making extremely difficult, because oil-price increases threatened to raise the overall inflation rate significantly. The Federal Reserve attempted to contain the inflationary effects of the oil-price shocks by engineering sharp increases in interest rates, actions which had the unfortunate side effect of sharply slowing growth and raising unemployment, as in the recessions that began in 1973 and 1981.” See https://www.federalreserve.gov/Boarddocs/Speeches/2004/20041021/default.htm. 11 Lee E. Ohanian, “Competition and Decline of the Rust Belt,” Economic Policy Paper 14-6, Federal Reserve Bank of Minneapolis, December 2014, https://www.minneapolisfed.org/~/media/files/pubs/eppapers/14-6/epp_14-6_rev.pdf. 12 David G. Taar, “The Steel Crisis in the United States and the European Community: Causes and Adjustments,” in Issues in U.S.-EC Trade Relations, National Bureau of Economic Research, 1988, http://www.nber.org/chapters/c5960.pdf. 13 Douglas A. Irwin, Clashing Over Commerce (Chicago: University of Chicago Press, 2017), 536. 14 David G. Taar, “The Steel Crisis in the United States and the European Community: Causes and Adjustments,” in Issues in U.S.-EC Trade Relations, National Bureau of Economic Research, 1988, http://www.nber.org/chapters/c5960.pdf. 16 Robert Bruno, Steelworkers Alley: How Class Works in Youngstown (Cornell University Press, 1999), 9. 17 Bruno, Steelworkers Alley: How Class Works in Youngstown. 18 Tim Sablik, ”Recession of 1981–82,” Federal Reserve History, November 2013, https://www.federalreservehistory.org/essays/recession_of_1981_82. 19 “Sun Belt” was coined more than a decade earlier by Kevin Phillips in The New Republican Majority; see Anne Trubeck, “Why the Rust Belt Matters,” Belt Magazine, April 15, 2016, http://beltmag.com/why-rust-belt-matters/. 22 Recollection of the Carnegie task force members who served in former president William Clinton’s administration. 23 The Economic Policy Institute (EPI), which maintains strong ties to organized labor, produced estimates of total job loss in each state as a result of NAFTA, putting Ohio’s loss at 34,900 manufacturing jobs between 1994 and 2010; see Robert E. Scott, “The High Price of ‘Free Trade’: NAFTA’s Failure Has Cost the United States Jobs Across the Nation,” EPI, November 2003, https://www.epi.org/files/page/-/old/briefingpapers/147/epi_bp147.pdf. However, Public Citizen, an advocacy group affiliated with Ralph Nader, estimated even higher NAFTA-related job losses than the EPI; see Global Trade Watch, NAFTA’s 20-Year Legacy and the Fate of the Trans-Pacific Partnership, Public Citizen, 2014, http://www.citizen.org/documents/NAFTA-at-20.pdf. John McLaren and Shushanik Hakobyan demonstrated that the agreement’s overall impact on U.S. labor markets was very small or zero but that there were statistically significant negative impacts in specific industries and geographic locations. Relying on U.S. census data from 1990 and 2000, McLaren and Hakobyan illustrated how workers without a college degree were able to earn higher wages in certain manufacturing industries because they were protected from foreign competition through tariffs. After those tariffs on Mexican-made products, such as footwear, apparel, textiles and plastics, were lifted under NAFTA, however, U.S. firms had to reduce wages or lay off workers. These less-skilled, displaced workers did not have plentiful alternative employment opportunities, so they ended up having to take lower paying jobs, often in the service sector. In towns dominated by such previously protected industries, the glut of less-educated workers ended up depressing wages for all of them, including in the service sector. North Carolina and South Carolina were among the states most vulnerable to this effect, but Ohio suffered from this phenomenon, too, especially in a number of smaller cities and towns. See John McLaren and Shushanik Hakobyan, “Looking for Local Labor Market Effects of NAFTA,” Review of Economics and Statistics, October 2016, 98(4): 728–741, http://www.nber.org/papers/w16535. 24 “The Impact of Tariffs on the U.S. Auto Industry,” Testimony Before the United States Senate Committee on Finance, Submitted by Josh Nassar, United Auto Workers Legislative Director, September 26, 2018, https://www.finance.senate.gov/imo/media/doc/26SEP2018NassarSMNT.pdf. 25 Peterson Institute for International Economics, “NAFTA 20 Years Later: Essays and Presentations at the Peterson Institute for International Economics Assessing the Record Two Decades After Approval of the North American Free Trade Agreement,” Briefing No. 14-3, November 2014, https://piie.com/publications/briefings/piieb14-3.pdf. 26 Policy Matters Ohio, “Trade Adjustment Assistance: New Opportunities for Ohio Workers,” May 18, 2009, https://www.policymattersohio.org/research-policy/fair-economy/work-wages/trade-adjustment-assistance-new-opportunities-for-ohio-workers. 28 United States Department of Labor, Data on TAA Petitions and Determinations, accessed on April 30, 2018, https://www.doleta.gov/tradeact/taa-data/petitions-determinations-data/. 29 Shkurti and Stewart, “The Decline of Ohio.” Original data: U.S. Census Bureau, 1953–1989; Statistical Abstract of the United States, various years; Bureau of Labor Statistics, Employment in Non-Agricultural Establishments by Industry by State; Ohio Bureau of Labor Market Information, Current Employment Query, 1990–2016, http://ohiolmi.com/. 30 Justin R. Pierce and Peter K. Schott, “The Surprisingly Swift Decline of US Manufacturing Employment,” American Economic Review 106, no.7 (2016): 1632–1662, http://faculty.som.yale.edu/peterschott/files/research/papers/pierce_schott_pntr_2016.pdf. 32 Daron Acemoglu, David Autor, David Dorn, Gordon H. Hanson, and Brendan Price, “Import Competition and the Great US Employment Sag of the 2000s,” Journal of Labor Economics 34, no. S1, Part 2 (2016): S141–S198. http://economics.mit.edu/files/9811. 33 Robert E. Scott, “Growth in U.S.–China Trade Deficit Between 2001 and 2015 Cost 3.4 Million Jobs,” Economic Policy Institute, January 31, 2017, https://www.epi.org/publication/growth-in-u-s-china-trade-deficit-between-2001-and-2015-cost-3-4-million-jobs-heres-how-to-rebalance-trade-and-rebuild-american-manufacturing/. 34 Author interview with Professor Ian Sheldon, trade economist, The Ohio State University, July 9, 2018. 35 “Ohio’s Exports to China,” State Report, The U.S.-China Business Council, 2018, https://www.uschina.org/sites/default/files/uscbc_ohio_state_report_2018.pdf. 36 Mary Amiti, Mi Dai, Robert Feenstra, and John Romalis, “How Did China’s WTO Entry Benefit U.S. Consumers?” National Bureau of Economic Research, June 2017, http://www.nber.org/papers/w23487. 37 Eduardo Porter, “Trump Isn’t Wrong on China Currency Manipulation, Just Late,” New York Times, April 11, 2017, https://www.nytimes.com/2017/04/11/business/economy/trump-china-currency-manipulation-trade.html. 38 Michael J. Hicks and Srikant Deveraj, “The Myth and the Reality of Manufacturing in America,” June 2015, Ball State University, https://projects.cberdata.org/reports/MfgReality.pdf. 39 Susan Houseman at the Upjohn Institute for Employment Research states that overall figures for U.S. manufacturing job losses attributed to automation rely on inflated assumptions about the manufacturing industries’ rate of growth in productivity and output. For example, just because a computer chip doubles in speed and performance each year does not mean U.S.-based manufacturers have produced twice as many computers per worker each year. The total number of U.S.-made computers may have actually fallen due to offshoring of production to Asia. See Susan N. Houseman, “Understanding the Decline of U.S. Manufacturing Employment,” Upjohn Institute for Employment Research, January 2018, http://www.upjohn.org/mfg-decline.pdf. Policy analyst Adams Nager and Robert Atkinson, president of the Information Technology and Innovation Foundation, which maintains strong ties to tech industries, also caution against exaggerating technology-related job losses and underappreciating those due to foreign mercantilist trade practices and lack of American competitiveness. See Adams Nager, “Trade vs. Productivity: What Caused U.S. Manufacturing’s Decline and How to Revive It,” Information Technology and Innovation Foundation, February 2017, http://www2.itif.org/2017-trade-vs-productivity.pdf. See also Adams B. Nager and Robert D. Atkinson, “The Myth of America’s Manufacturing Renaissance: The Real State of U.S. Manufacturing,” Information Technology and Innovation Foundation, January 2015, http://www2.itif.org/2015-myth-american-manufacturing-renaissance.pdf. These findings may be less applicable for Ohio, where productivity numbers are much less affected by computer manufacturing. In Ohio, where industries such as steel and autos are more prevalent, productivity increases have been easier to measure and have been substantial. For example, the Bureau of Labor Statistics reports productivity in motor vehicle production increased an average of 3.1 percent a year from 1987 to 2016. For primary metals, including steel, it increased 2.6 percent; see Bureau of Labor Statistics, “Productivity and Related Measures for Selected NAICS Industries 1987 to 2016,” in Proquest Statistical Abstract 2018 Online, Table 661. 40 A human welder today earns around $25 per hour (including benefits). The Boston Consulting Group (BCG) recently calculated that a robot, performing similar functions, costs the manufacturer approximately $8 per hour to operate (when factoring installation, maintenance, operations and depreciation). BCG assessed that, in fifteen years, the operating cost per hour for a robot doing similar welding tasks could plunge to as little as $2 per hour when factoring in improvements in its performance; see Hal Sirkin, Michael Zinser, and Justin Rose, “How Robots Will Redefine Competitiveness,” Boston Consulting Group, September 2015, https://www.bcg.com/publications/2015/lean-manufacturing-innovation-robots-redefine-competitiveness.aspx. 41 Robotic Industries Association, “Robots, Vision, and Motion Control Industries Set New Growth Records in 2017,” February 26, 2018, https://www.robotics.org/content-detail.cfm/Industrial-Robotics-News/Robotics-Vision-and-Motion-Control-Industries-Set-New-Growth-Records-in-2017/content_id/7019. 43 Michael Shields, “Manufacturing a High-Wage Ohio,” Century Foundation, March 12, 2018, https://tcf.org/content/report/manufacturing-high-wage-ohio/. 44 Shkurti and Stewart, “The Decline of Ohio.” Original data based on Ohio Department of Development, Ohio Research Office, Bureau of Economic Analysis data on Per Capital Income (May 2017). 45 Edward Alden, Failure to Adjust: How Americans Got Left Behind in the Global Economy (Lanham, Maryland: Rowman and Littlefield, 2016). 50 Benjamin Collins, “Trade Adjustment Assistance for Workers and the TAA Reauthorization Act of 2015,” Congressional Research Service, August 14, 2018, https://fas.org/sgp/crs/misc/R44153.pdf. 51 U.S. Department of Labor, Employment and Training Administration, “Trade Adjustment Assistance: Petition Calculator,” accessed November 8, 2018, https://www.doleta.gov/ tradeact/taa-data/petitions-determinations-data/petition-calculator.cfm. 52 Ronald D’Amico and Peter Z. Schochet, “The Evaluation of the Trade Adjustment Assistance Program: A Synthesis of Major Findings,” (paper prepared for the U.S. Department of Labor Employment and Training Administration, December 2012), https://wdr.doleta.gov/research/FullText_Documents/ETAOP_2013_08.pdf. 53 Author interviews in Cleveland, Coshocton, Dayton, and Marion, from May–July 2018. 55 Author interviews with AFL-CIO representatives in Washington, DC, on April 25, 2018, and Columbus, Ohio, on June 29, 2018.